Dysmyelination is a genetic disorder still in the process of being classified, with varying patterns seen on magnetic resonance imaging (MRI). Van der Knaap disease is one of the rare dysmyelinating conditions recognized as a separate entity as late as 1995. The various genetic mutations responsible for phenotypic expression of this condition are coming to the fore. This has prognostic implications, which are important to appreciate. 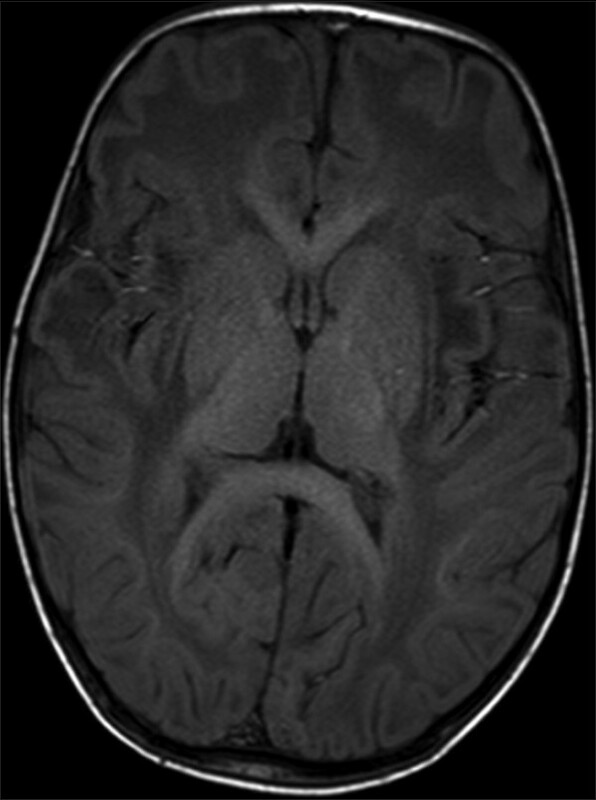 A 3-year-old child with a large head presented with delayed walking, which he started as late as 2½ years. The walk is unstable and wobbly. The child frequently falls after walking a few steps in a wobbly manner. The head size is large with a diameter of 51.5 cm (>97 percentile for age for Indian boys). There is no history of any seizures. Motor and sensory examination was normal. Mental development was normal. MRI showed diffusely increased cerebral white matter signal on T2 Weighted Image (T2WI) [Figure 1] and Fluid Attenuated Inversion Recovery (FLAIR) images [Figure 2] and [Figure 3] but reduced cerebral white matter signal on TIWI [Figure 4] with relative sparing of central white matter including, internal capsule, brainstem, and corpus callosum. The cerebellum is uninvolved [Figure 5]. Bilateral sub cortical cysts were found in anterior temporal regions. Magnetic Resonance Spectroscopy (MRS) revealed low normal N Acetyl Aspertate (NAA), and Choline was within the normal limits, as well. Their ratio was also normal. Myelin provides insulation as well as facilitates conduction of impulses in the nervous system. Its exclusive presence in vertebrates suggests the relative advancements of the nervous system in these higher animals. MRI has enabled the recognition of various dysmyelination disorders. Over 50% of the leukodystrophies are still unclassified and do not fit into any recognized pattern. This poses an ongoing challenge faced by the present day medical fraternity. Since 1995, few new dysmyelination patterns have been recognized as distinctive entities and given labels. Attempts have been made to identify the underlying genetic defects in these, successfully in some cases and still groping in the dark in others. The inability to find the causative genetic defect in many of these means we are still a long distance away from fully comprehending these conditions, and offering any remedial measures to the patients afflicted by these conditions. One of these, earlier unclassified white matter diseases, Megalencephalic leukoencephalopathy with sub cortical cysts (MLC) also known as Van der Knaap disease was first described in the medical literature in 1995. Earlier; however, a series of 18 patients had been presented by Singhal et al. from India at 8 th Asian and Oceanian Congress of Neurology at Tokyo in 1991,  which they subsequently published in 1996. Since then apart from a few isolated cases, only two significant series have been described in the literature - one by Singhal et al. of 31 patients and other by Topçu et al. of 12 Turkish patients, which established genetic nature of this disease. Initially, this condition was thought to be an inherited autosomal recessive disorder caused by MLC1 bi allelic gene mutation present on chromosome 22q13.3 and the classic phenotype was called MLC. In rat primary astrocytes, reduction of MLC1 expression resulted in the appearance of intracellular vacuoles. Absence of MLC1 gene defect in nearly 30-35% cases led to further search resulting in recognition of Hepatocyte Cell Adhesion Molecule (HEPACAM) bi allelic gene mutation on chromosome 11q24. This group of disorders was labeled as MLC2A. While both MLC1 and MLC2A were found to have slowly progressing disability, another subgroup named MLC2B, attributed to heterozygous HEPACAM mutation has improving phenotype. This is an autosomal dominant variant. The diagnosis of MLC is made with confidence in patients having typical clinical picture combined with characteristic MRI findings. Genetic testing isn't mandatory in making the diagnosis. Demonstration of mutations MLC1 or HEPACAM is supportive, but their absence in classic cases having both clinical and MR pictures of MLC may be due to as yet unrecognized mutations or technical failure. Macrocephaly ,,, invariably develops in these patients within the first year of life, though it may be present right at birth in few. At the end of the first year, the head size may be as large as 98 percentile of expected size for age (standard deviation 4-6 above mean). Subsequent head size increase with age is normal and follows a line above and parallel to 98 percentile. In MLC-2B, rate of head size increase may be slower than normal, thereby leading to normal sized head at later age. The next common presenting feature is slightly delayed walking, which may be unstable and wobbly, resulting in frequent falls. Early intellect development may be normal or only little delayed. Motor functions start to get affected usually in early childhood or later. Mild spasticity and cerebellar ataxia may set in. Pyramidal symptoms are late and mild. Deep tendon reflexes may be brisk. Dysphagia and dysarthria may develop. Most of the children who can walk independently without support become wheel chair dependent by late childhood, although some individuals can walk even in their forties. The hallmark features of MLC on cranial MRI are diffusely abnormal, high signal mildly swollen white matter on T2WI involving cerebral hemispheres. Deep white matter structures including, corpus callosum, internal capsule, and midbrain are spared. Invariable presence of sub cortical cysts in anterior temporal and often in fronto parietal regions is diagnostic. As time passes, these sub cortical cysts increase in size and number, while white matter swelling decreases and mild atrophy ensues. Cavum septum pellucidum and cavum vergae have been seen in most of the patients. Occasional involvement of pyramidal tracts and cerebellum has also been noted. MRS studies demonstrate near normal NAA as there is no significant neuronal loss. The Choline levels are not raised as there is no demyelination (different from dysmyelination seen in these patients). NAA to choline ratios and choline to creatinine ratios are normal or show only mild decrease. 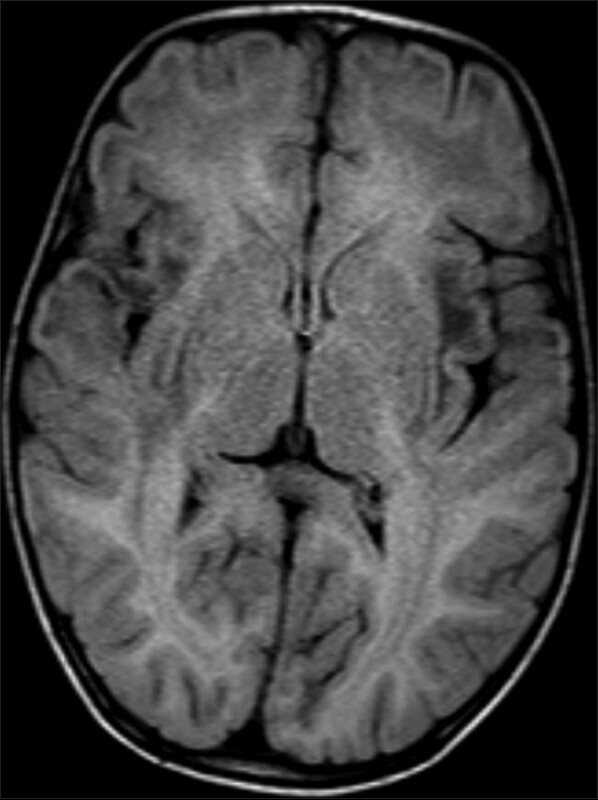 The differentials considered for macrocephaly with diffuse leukoencephalopathy include Canavan disease, Alexander disease, Infantile onset GM2 gangliosidosis, occasionally Infantile onset GM1 gangliosidosis, L-hydroxy glutaric aciduria, and a congenital muscular dystrophy called merosin deficiency (MDC1A). As opposed to others MLC is quite a mild disease and has slower progression. Of these MDC1A resembles MLC most, but sub cortical cysts are lacking and patients have myopathy in addition. Canavan disease, unlike MLC involves thalamus and globus pallidus. Sub cortical cysts are lacking in Canavan disease. Genetic testing for Aspartoacylase (ASPA) is diagnostic for Canavan disease. In Alexander disease, white matter involvement has frontal dominance, with involvement of deep white matter. In addition, Alexander disease lesions show contrast enhancement, unlike MLC. Infantile onset gangliosidosis show basal ganglia and thalamus involvement, which is absent in MLC. Management of these children is mainly supportive, such as antiepileptic drugs for seizure control, physical therapy for improving motor functions, etc. Since minor head trauma may cause temporary rapid deterioration, all preventive steps should be taken to prevent head injury. Since these are genetic disorders having autosomal recessive (or autosomal dominant in MLC2B) inheritance, genetic counseling assumes significance. Consanguineous marriages must be discouraged. 1. Agarwal DK, Agarwal KN. Physical growth in Indian affluent children (birth-6 years). Indian Pediatr 1994;31:377-413. 3. Singhal BS, Gursahani RD, Biniwale AA, Udani VP. Megalencephalic leukodystrophy in India. Tokyo, Japan: In Proceedings of the 8 th Asian and Oceanian Congress of Neurology; 1991. p. 72. 4. Singhal BS, Gursahani RD, Udani VP, Biniwale AA. Megalencephalic leukodystrophy in an Asian Indian ethnic group. Pediatr Neurol 1996;14:291-6. 5. Singhal BS, Gorospe JR, Naidu S. Megalencephalic leukoencephalopathy with subcortical cysts. J Child Neurol 2003;18:646-52. 6. Topçu M, Gartioux C, Ribierre F, Yalçinkaya C, Tokus E, Oztekin N, et al. Vacuoliting megalencephalic leukoencephalopathy with subcortical cysts, mapped to chromosome 22qtel. Am J Hum Genet 2000;66:733-9. 7. Duarri A, Lopez de Heredia M, Capdevila-Nortes X, Ridder MC, Montolio M, López-Hernández T, et al. Knockdown of MLC1 in primary astrocytes causes cell vacuolation: A MLC disease cell model. Neurobiol Dis 2011;43:228-38. 8. Topcu M, Saatci I, Topcuoglu MA, Kose G, Kunak B. Megalencephaly and leukodystrophy with mild clinical course: A report on 12 new cases. Brain Dev 1998;20:142-53. 9. Gorospe JR, Singhal BS, Kainu T, Wu F, Stephan D, Trent J, et al. 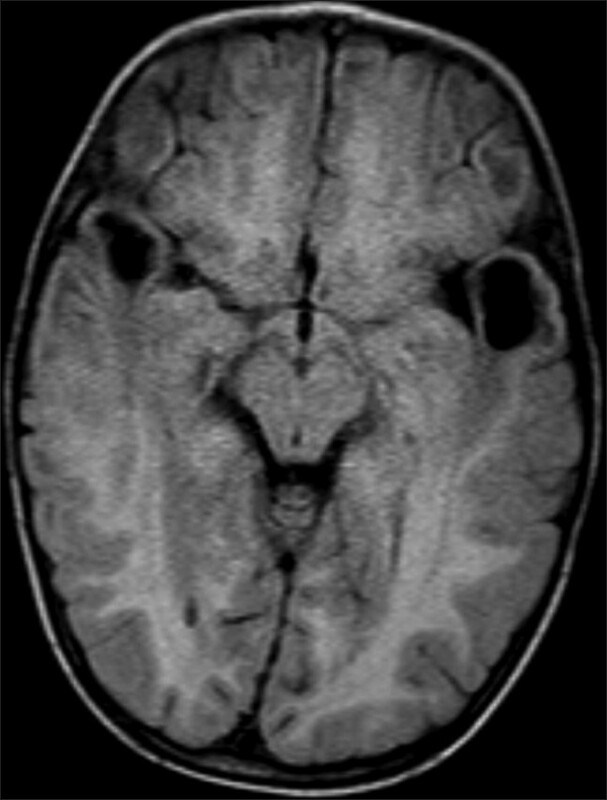 Indian Agarwal megalencephalic leukodystrophy with cysts is caused by a common MLC1 mutation. Neurology 2004;62:878-82. 10. Ben-Zeev B, Levy-Nissenbaum E, Lahat H, Anikster Y, Shinar Y, Brand N, et al. 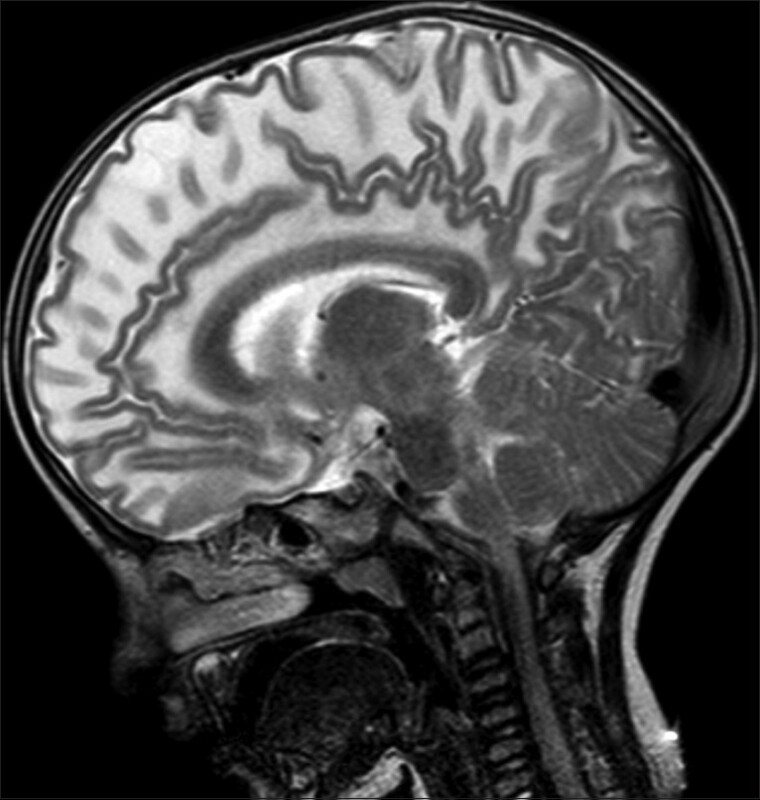 Megalencephalic leukoencephalopathy with subcortical cysts; a founder effect in Israeli patients and a higher than expected carrier rate among Libyan Jews. Hum Genet 2002;111:214-8. 11. Goutières F, Boulloche J, Bourgeois M, Aicardi J. Leukoencephalopathy, megalencephaly, and mild clinical course. 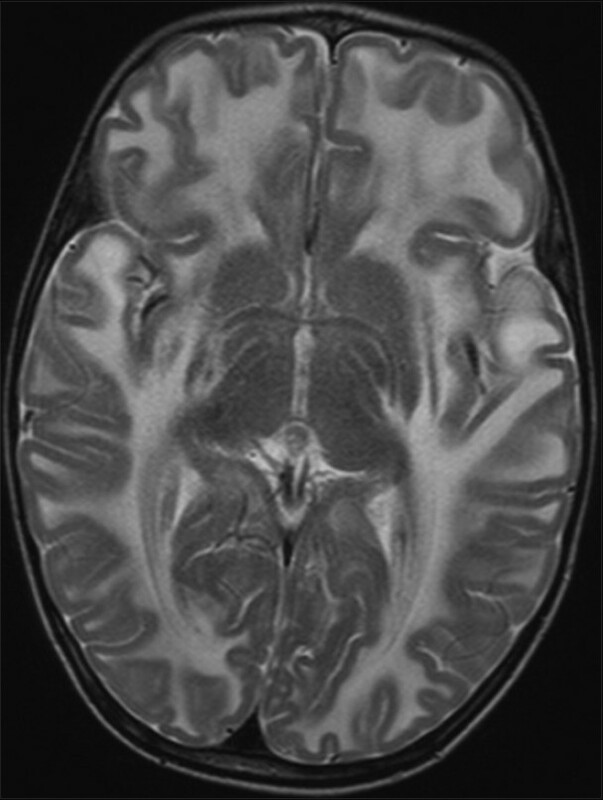 A recently individualized familial leukodystrophy. Report on five new cases. J Child Neurol 1996;11:439-44. 12. Yalçinkaya C, Yüksel A, Comu S, Kiliç G, Cokar O, Dervent A. Epilepsy in vacuolating megalencephalic leukoencephalopathy with subcortical cysts. Seizure 2003;12:388-96. 13. Sugiura C, Shiota M, Maegaki Y, Yoshida K, Koeda T, Kitahara T, et al. Late-onset neuropsychological symptoms in a Japanese patient with megalencephalic leukoencephalopathy with subcortical cysts. Neuropediatrics 2006;37:286-90. 14. Bugiani M, Moroni I, Bizzi A, Nardocci N, Bettecken T, Gärtner J, et al. Consciousness disturbances in megalencephalic leukoencephalopathy with subcortical cysts. Neuropediatrics 2003;34:211-4.